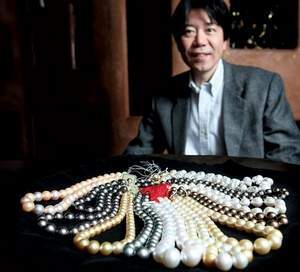 Pearl specialist, Koji Kawamoto, has been in the pearl industry his whole life. Koji is from Mie, Prefecture, a small village in Japan where the process of culturing pearls was first discovered in 1893 by Kokichi Mikimoto. There are so many different kinds and types of pearls. Koji always brings Akoya pearls from Japan, White South Sea pearls from Australia, Black Tahitian pearls from French Polynesia, Golden South Sea pearls from the Philippines and Indonesia and freshwater pearls from China. Koji prides himself on his talent for what he calls “matchmaking” the strand of pearls itself and to the owner of the strand. With his sheer gut instinct the wearer’s skin color and eye color cue him into a perfect union. Karats often features pearl jewelry trunk shows by pearl master Koji Kawamoto.